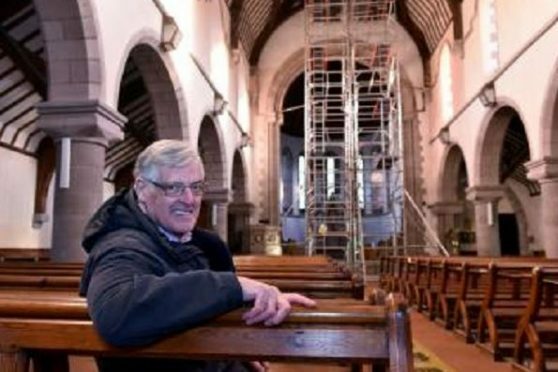 Christmas celebrations in a north-east community have gained the go-ahead after a historic church ceiling was deemed to be “safe”. The A-listed Episcopal Church of St James in Stonehaven, was forced to cancel a Remembrance Sunday service recently after a large section of its roof collapsed. But now, specialist building surveyors, Richardson and Starling in Aberdeen, have surveyed the property and passed on positive findings to church convenor David Fleming. He said: “They have assured me that the ceiling is safe. It has been patched up and after a clean up, we are hoping to be open for business again on December 4. The church was given an A-listed rating in 1993, more than 100 years after the first foundation stone was laid in 1875. It has been granted £119,000 from the Heritage Lottery Fund and officials are hoping to secure an extra £61,000 to cover recent roof repairs. Mr Fleming added: “Once the surveyors started to have a look in the roof space, they found there was some more work that needed to be done. The Heritage Lottery Fund Grants programme is designed to give something valuable back to the community and Mr Fleming has planned new two exhibition spaces for the church. Aimed at attracting visitors to St James, Mr Fleming wants the exhibition to be “interactive” and “exciting”. He explained: “Our doors are always open. I don’t want people to just come in and say ‘Ooh, what a lovely building’; I want them to come right in through the doors and perhaps learn something they didn’t know before.